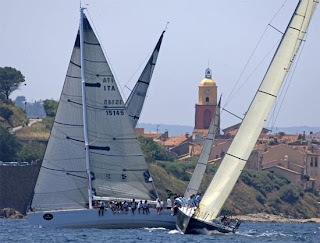 In a pleasant 10-15 knot southeasterly breeze, today's two inshore races formed a perfect start to the 2009 ORC International World Championship regatta, hosted by the Circulo Vela Brindisi. 77 entries from seven countries are on hand for this 11th annual event organized by the Offshore Racing Congress (ORC). 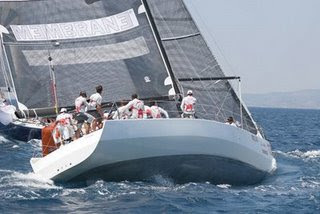 On the strength of a 3-1 scorecard, George Andreadis' GS 42R Meliti VI leads the 36-boat Class A, but only by a point over the Russo-Brenca-De Falco syndicate's GS 56R Athenor -Ola - Citta di Siracusa. Even though there are a wide variety of boat types and sizes here, and the two classes share the same race course, the competition in this class has proven to be tight, with the top five finishers correcting to within a minute in the results of Race 2. But in Class B Guiseppe Guiffre's M37 Low Noise has taken a strong initial jump over their 40 rivals by winning double bullets today. Low Noise holds a 4-point lead over nearest rival Alvorosky, a GS 40R owned by Franceso Siculiana. What Class B may have lacked in their closeness of corrected time results compared to Class A they more than made up for in levels of aggressiveness on the starting line, with two general recalls made on the start of the second race. The 1-knot south-flowing current was also in part to blame. Tomorrow racing resumes with the start of the coastal offshore race, which is actually scored as two races with a 1.5 point value each as boats are timed at the turning mark and at the finish. The actual course and its length will not be announced until tomorrow so race managers can give the best course possible based on the weather forecast to fill the ORC's mandate to have this race be approximately 24 hours in length and provide a variety in conditions suitable for an offshore World Championship.